Over 35 years ago, when I wrote my first travel guide to Cozumel, I included the recommendation that before you go to the east coast of the island, first go by a tlapalería and buy a small bottle of tiner (paint thinner) so you could clean the tar off of your feet after walking on the beach. 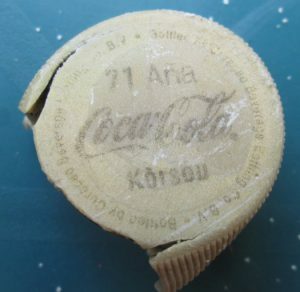 Back then, we had very little trash on the east coast beaches, but loads of tar and crude oil residue. Today, the tar has disappeared, along with most tlapalerías. However, the amount of garbage one finds today on the east coast beaches of Cozumel is truly astounding. Where does it all come from? If you ask people living on Cozumel where all the debris comes from, most of them say “it comes from the Cruise Ships.” If you ask tourists the same question, they say “it’s left by the Mexicans.” I suspected neither of these two statements was true, so I made a little experiment. I went to a stretch of sandy beach on the east side of the island and marked off a 300-meter-long length of beachfront. Then, I walked along this stretch while examining the garbage that was there, and picked up any examples that had a label on it that stated the country of manufacture. 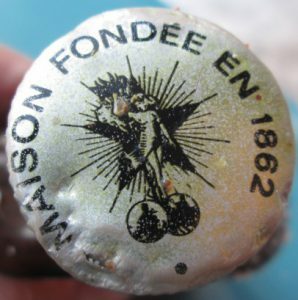 Obviously, there were many, many pieces whose paper labels had washed off, or whose inked labels had faded away, but there were still plenty of pieces of refuse with legible labels. I found several items listing the country of manufacture as USA, China, or Canada. This does not mean, however, that these particular pieces of litter were tossed or washed into the sea directly from these three countries. These products were most likely first exported to countries bordering the Caribbean and then their containers were thrown away in the country that imported them. Since I had no way of finding out where they were discarded, I did not count them in my experiment. The two countries of origin that I encountered most frequently were Haiti and Dominican Republic, both of which occupy the Caribbean island of Hispaniola. The Haitian product packages were mostly beauty products (35), Barbancourt and Bakara Rum bottles (6), skin lightener (8) plastic butter tubs (13) and assorted other bottles and bottle caps (16). I suspect that many of the disposable razors (50+) whose blades had been removed (for recycling?) also came from Haiti, but I couldn’t be sure. By the looks of the large amount of completely worn-out toothbrushes (41) and toothpaste tubes that had been squeezed bone-dry (18), or cut in half to get the last drop of toothpaste out (7 halves), I would imagine these also came from a very poor nation like Haiti; but again, that’s just a guess. The products from the Dominican Republic were mostly beauty aids, bottles, and medicine containers. The next countries represented in the sampling, in order of precedence, were Jamaica, Venezuela, Honduras, Cuba, Guatemala, Colombia, Mexico, Nicaragua, Curaҫao, St. Vincent & the Grenadines and Trinidad. Note how far down the list Mexico ranked as a polluter-nation. I found three pieces, oddly enough, manufactured in El Salvador, a small Central American country on the Pacific coast. They had probably been imported into Guatemala or Honduras and then discarded from one of those countries. The one solitary item (a tube of anti-wrinkle cream) labeled “Made in Chile” and the single medicine bottle labeled in Arabic I have no way of reckoning how they made it to Cozumel. I found no Costa Rican or Panamanian items, but looking at the circular motion of the gyre current that peels off from the main northward-flowing Caribbean current, I am not surprised. Trash originating from these two Central American countries is most likely doomed to end up as part of some huge raft of floating debris stuck in the middle of this gyre. See the chart below to see the direction of the Caribbean ocean currents. 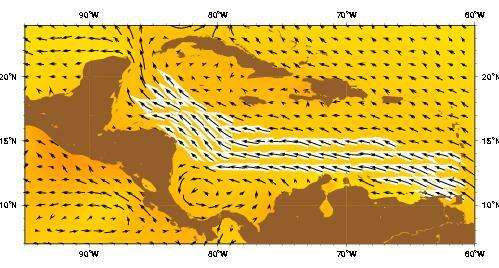 The Caribbean current as represented by the Mariano Global Surface Velocity Analysis (MGSVA). 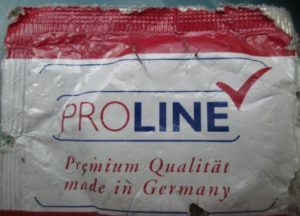 As far as items that could be traced back to Cruise-ships, I found no “smoking guns.” However, I did find a number of items from France, Greece, Italy, and the Netherlands, along with one unused condom made in Germany that was still in its original package. These items seemed to me to be more indicative of things purchased by the crew of cargo ships or tanker ships. Other items that looked to be items lost or jettisoned by cargo ships included hard-hats, plastic hoses, and an orange safety vest. In conclusion, I believe that over 90% of the litter that festoons the east coast of Cozumel originates as garbage deliberately dumped into rivers, bays, or ocean by residents of the countries located in the north coast of South America, the greater and Lesser Antilles, or Central America north of Costa Rica.